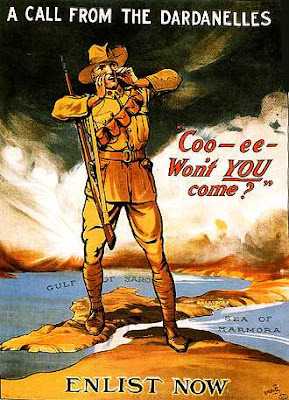 In the early hours of April 25, 1915, Australia and New Zealand entered World War 1. Neither country was being directly invaded or even threatened. The Anzac troops were offloaded on the beaches of Gelibolu (or Gallipoli as we know it) at the Cannakale peninsula of western Turkey. The landing was part of a disastrous war strategy developed by their British war commanders. The young men were part of an imperial army, fighting for King more than their own country. As if to underscore just how much this battle was the war for foreign powers, one of the most characteristically Australian symbols of the campaign was the image of Simpson and his donkey trudging through the hills above Anzac Cove rescuing the war wounded. The reality, of course, is that John Simpson Kirkpatrick was an English illegal immigrant who joined the war effort in Australia by accident when he boarded a ship carrying Anzac troops to the frontline. Kirkpatrick was not seeking to fight but rather just a free ride back home to Mother England. Yet for many non-Irish diggers, being British did not make you any less Australian. In fact, even using Australian symbols to the exclusion of British ones was regarded as extremely provocative. In a recent book review published in The Canberra Times, Frank O'Shea writes about Irish returned soldiers causing major controversy when they marched in 1920 under the Australian flag, not the Union Jack. In doing so, they effectively declared that they had fought for Australia rather than for Britain The Irish in Australia were Australians as well as Irish, whereas the loyalists were British first and Australian second. Try telling the drunken racist rioters at Cronulla that they should also be holding up the Union Jack! Few Australians know that New Zealand lost a much higher proportion of troops than Australia. Over 85 per cent of Kiwi troops were killed or wounded, compared to 50% of the Aussies. The comparatively lesser Australian war losses may explain why Australians are still much keener to participate in other people's wars than their cousins across the Tasman. The largest New Zealand force in the Vietnam War was hardly 540 men, although over 3000 Kiwis did volunteer to join the war effort. Since then, New Zealand has been far more circumspect about its military and even broader security relations with the United States. In a 2003 paper published by the Strategic Studies Institute of the US Army War College, Dr Andrew Scobell notes that New Zealand had made its involvement in the war conditional on it receiving the imprimatur of the United Nations. Even then, New Zealand's involvement would be limited to providing logistical and humanitarian assistance and specialised military forces such as medical, engineering and mine clearance units. Compare this to the government of then Prime Minister John Howard. Scobell notes that Howard, apart from former British PM Blair, was the staunchest supporter of a US-led military action against Iraq. Moreover, Australia is one of the few countries ready and willing to provide combat forces for a conflict with Iraq. In doing so, of course, Australia has also placed itself in the firing line of a variety of international terrorist groups. Iraq is not the only foreign military adventure in which Australians are involved and which is going rather pear-shaped. How many Australians expected the Taliban to successfully regroup and fight so hard after their crushing defeat in 2001? Australia's new Defence Minister, Joel Fitzgibbon, has been calling on Nato commanders to reconsider military strategies in Afghanistan that are clearly failing and have already cost Australian lives. Not to mention that terrorists now have two reasons to eye Australia. Perhaps the most shameful aspect of Australia's military history is its mistreatment of indigenous servicemen and women. Thousands of indigenous Australians fought overseas, with many hundreds giving the ultimate sacrifice to defend their nation. Yet the dead were buried in unmarked graves whilst the survivors were ineligible for returned servicemen land grants or even membership of Returned Services League (RSL) clubs. So blackfellas were good enough to fight alongside white Australia, but that's where the new-found equality ended. How could this happen in a nation that defines itself by the noble digger? The technical answer is because Aboriginal people weren't considered Australian citizens until the referendum of 1967, so they didn't qualify for all the benefits that comes with being an Aussie. So until 40 years ago, indigenous Australians were certainly fighting the wars of a country that did not recognise them as its own. What difference exists between this and fighting for a foreign power? And thanks to the compulsory quarantining of pensions as part of the Northern Territory Intervention in Aboriginal communities, many indigenous ex-servicemen are having their pensions compulsorily quarantined. With bigger battles against profound indigenous disadvantage to fight at home, why does my government continue to fight others' wars overseas. Irfan Yusuf is a Sydney lawyer and writer. This article was first published in The Press of Christchurch on ANZAC Day, Friday 25 April 2008. Here's a short history quiz. Name a country founded in the late 1940s from British-administered lands and established on the basis of ethno-religious identity for a group who regarded themselves as a nation separate to their host nation. Believe it or not, there are two correct answers. Stranger still, these two countries declared their independence exactly nine months apart. The parallels aren't exact, but the exercise can suggest interesting conclusions. Israel, the world's only modern Jewish state, declared its independence on May 14, 1948. Exactly nine months earlier, the new nation of Pakistan, founded as a homeland for Indian Muslims (or "Mussalmanoh" in Urdu/Hindi) declared its independence. Pakistan was created out of those regions of India (save Kashmir) which had Muslim majorities. One could argue that the political mythology underlying Pakistan's creation almost exactly matches that of Israel. Pakistan's founders promoted a kind of Indian Muslim Zionism, claiming Indian Muslims were a nation separate from the rest of India. The respective political mythologies of Pakistan and India run deep in the psyche of most South Asian migrants. The result for the children of both sets of migrants is often boring Sunday afternoon lunches where kids are forced to watch their parents trying to reinvent history. A gathering of Indian and Pakistani Muslims almost always involves a heated discussion on whether Pakistan should have been created. Indian Muslim expats question Pakistan's political mythologies, while Pakistani expats express outrage at Muslims expressing such virtual sacrilege. Strangely enough, such sacrilege manages to find its way into newspaper columns and TV talkshows inside Pakistan. It seems the expats have greater resistance to such debates than the relatives left behind. Israel and its diaspora supporters are also into their second and third generations. For these children and grandchildren of independence, the political mythology used to justify the creation and continued existence of their nation is no longer so sacred as to be beyond question. Still, I can (at least try to) understand why so many Jews feel strongly about Israel. The fact is that Israel has become central to Jewish identity, especially in Australia, which has the highest proportion of Holocaust survivors outside Israel. For many such survivors, Israel represents a kind of emotional insurance policy. Yet, just as more Muslims live in India than Pakistan, more Jews live in the United States than in all of Israel. The views of younger Jews critical of Israel may be uncomfortable for Israel's older supporters. Yet such arguments are happening inside Israel itself. Inevitably they will filter into the diaspora communities. In the years leading up to 1947, many prominent Indian Muslims opposed partition. They argued Indian Muslims were not a separate nation needing a homeland separate from India and believed the idea of Pakistan was an attempt to impose ethno-religious nationalism on the region. Similar arguments were used by Jewish opponents of Israel. Indeed Australia's first Australian-born Governor-General, Sir Isaac Isaacs, was opposed to the creation of a Jewish state in Palestine. He argued that such a state could not be created without displacement of hundreds of thousands of indigenous peoples and would cause unnecessary tension between the Jewish and Islamic worlds. In mentioning this, my purpose is not to re-visit the issue of Israel's right to exist. Muslims who insist Israel has no right to exist are deluding themselves. Such claims enter the realm of hypocrisy when expressed by Pakistani Muslims. If real and lasting peace is to occur in the Middle East, both Jews and Muslims need to re-assess their respective political theologies. Jewish spokesmen insistent on defending each and every Israeli action in Gaza and other areas where the Israeli Defence Forces have been occupied are beginning to increasingly resemble my irrational Pakistani uncles who refuse to acknowledge the excesses of the Pakistani Army in East Bengal. At the same time, it baffles me why so many Muslim countries refuse to recognise Israel's existence. Many use the issue of Palestinian human rights and sovereignty to justify their position. Of all Muslim countries, Pakistan should be at the forefront of encouraging dialogue with Israel and its diaspora supporters. Pakistanis understand at least some of the insecurities that lead a community to insist on separate nationhood based upon ethno-religious identity. I hope it doesn't sound too simplistic to suggest that support for Palestinian nationhood and human rights need not involve refusing to recognise the reality of Israel's existence. If anything, dialogue should be founded on mutual recognition. A saying common to Arabic and Hebrew can be roughly translated as: you can't clap with one hand. Those who refuse to recognise the rights of both Israel and Palestine to exist are just not serious about peace. I can't resist a couple of comments. What you say about Australian Jews is at least as true of of American Jews. I have long held that Israel is the only thing that holds American Jews together; it is the only thing almost all of them can agree on. As for the current generation questioning the myths, that is true within Israel but not in the diaspora in my experience. The Australian has been pumping out stories all week about how Griffith University's Islamic Research Unit (GIRU) could well become a Saudi-style Pakistani madressa after receiving a donation of $100,000 from the Saudi Kingdom. I pointed out some of the hypocrisies and absurdities in reporting by The Oz on the issue in yesterday's Canberra Times. You won't find the article on the CT website, though you can read it here. Naturally, one would never expect the owners of The Oz to accept any money from a Royal Family who run a dictatorship with an appalling human rights record. Imagine News Corporation accepting money from members of a government apparently busy spending millions radicalising young people and turning them into terrorists. Impossible. Well, not quite. GIRU's $100,000 Saudi donation is around $1.25% of what it is receiving from the Federal Government as part of the establishment costs of the Centre for Excellence in Islamic Studies. Compare this to the $400 million that Prince al-Waleed bin Talal invested in News Corporation around a decade ago. Apparently on that occasion, Mr Murdoch said the investment was "a new strategic alliance". 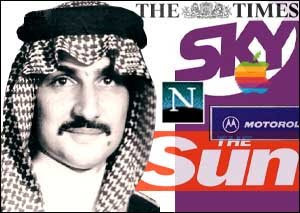 That investment was then increased in 2005 to the extent that the Saudi Prince owned 5.46% of voting shares. Of course, there doesn't appear to be any evidence that this massive influx of Saudi wahhabi money has influenced The Oz's reporting. Just as there is no evidence that the comparatively miniscule donation to GIRU has affected research conducted at GIRU. So next time a journo from The Oz wants to bag GIRU for accepting Saudi money, let s/he remember that her/his employer is also a beneficiary of Saudi largesse.